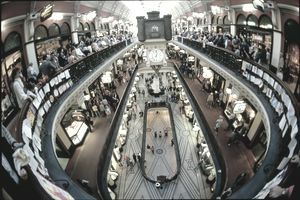 Even though it is at the bottom of the continental population list, Australia’s rank is high on the list of the world’s largest retailers. Australian retailers do not have prominence on other continents, but within its own borders, retailing is the largest employer, with an estimated 50% of the population having worked in retail at some time in their career. Each year a “Global Powers of Retailing” report is compiled by Deloitte Touche Tohmatsu ranks retail companies of all types in all countries according to total revenue. For at least a decade, that list has included Australian retail companies with annual revenue large enough to be ranked among the Largest Retail Companies in the World. What follows is the largest retail companies with headquarters in Australia, which are also among the largest retail chains in the world. This source of these retail revenue rankings is the 2016 Global Powers of Retailing report, which reflects revenues generated in FY 2014. Compare the 2016 rankings with those from 2010 to see how each of the largest Australian retail companies has improved, compared to every retail company everywhere in the past six years. There's a reason why the only two Australian retailing companies that are big enough to be included on the "World's Largest Retailers" list each year are both grocery retailing companies. Australia is not one of the largest retail industries in the world nor are Australian based retailing companies a formidable threat on the global retail stage. But that's understandable considering that Australia is a country with a population barely over 24 million people, which gives it a ranking of #53 on the World's Most Populated Countries List. $120 billion - Total economic activity in retail sectors (source: retail.org). 1.5 - Percentage of retail trade growth from 2014 to 2015 (source: Australian Government Productivity Commission). 5.99 - Average year-over-year increase in total Australian retail industry revenue between 1983 and 2016 (source: trading economics.gov). 5500 - Total number of retail companies (source: retail.org). 77,000 - Total number of brick-and-mortar retail locations. 1.7 million - Total number of retail industry jobs (source: retail.org). $60 billion - Wages earned by Australians working in the retail industry in 2015 (source: retail.org). 11% - Percentage of all employed Australians working in the retail industry. 40% - Percentage of retail industry employees who only work part-time. Category killers located in outlying areas with lower real estate prices. Fewer individually owned boutiques, more retail specialty chains. More consumer self-service, and less direct customer service assistance. Increased productivity due to better and more timely data. High street renovations and renaissance. Increase in private label brands to increase profits. International expansion of Australian-based retailers. Judging from these overall retail industry statistics and trends, it's clear that Australian retailing is not that much different from the U.S. retail industry. Foreign retail companies are also strongly represented in Australia, with retailing companies like Gap, Abercrombie & Fitch, Apple, Zara, Fossil and Costco capitalizing on the rising sales potential. In fact, startupsmart.com.au states that 43% of online sales in Australia go to overseas companies that are doing business in physical stores within Australia's borders and online. Australia’s GDP has shown continued growth throughout the economic downturn of recent years, thanks in part to the relatively large contribution of the retail sector. Through an increase in entrepreneurship and franchising, retail has become a driving force with a vital role in the Australian economy. The Australian retail industry growth has been fueled by the rise of the shopping mall, private equity investors, big-box retailers, vertical brand integration, and internet shopping. Online retailing in Australia is a challenge due to its isolated geography and the transportation challenges associated with the procurement of merchandise not produced within its borders. Despite that, Internet retailing is growing in Australia and in 2015 it is estimated that that Internet retail sales in Australia totaled $22.1 billion, which represents a 7% increase from 2014.